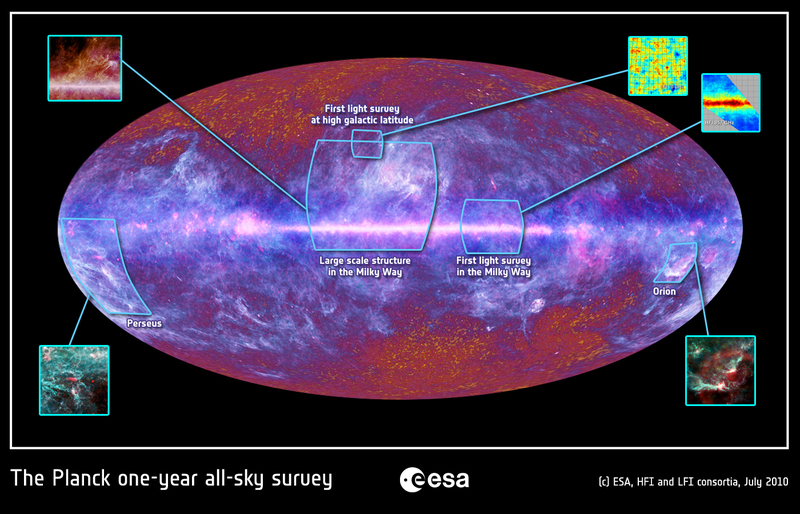 New Results: First All Sky Images from Planck! 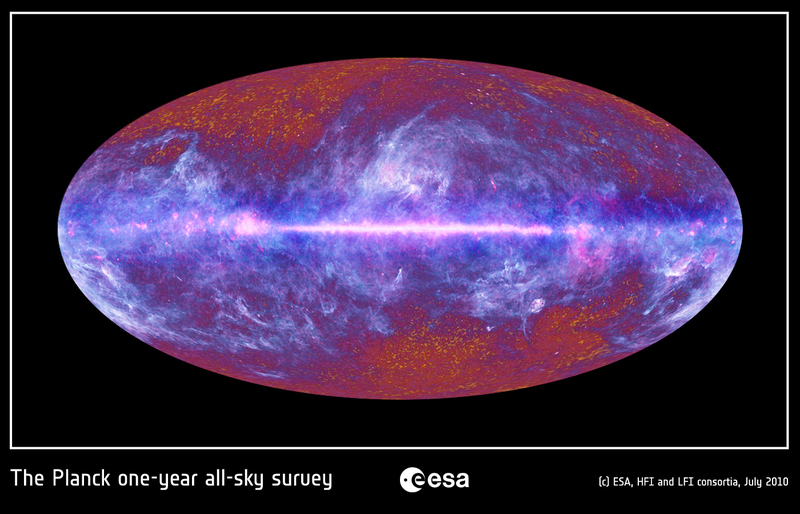 ESA today released the first all sky images from Planck. The first all sky survey was completed a few months ago, but it’s taken some time to get things processed to the stage where we can release images. 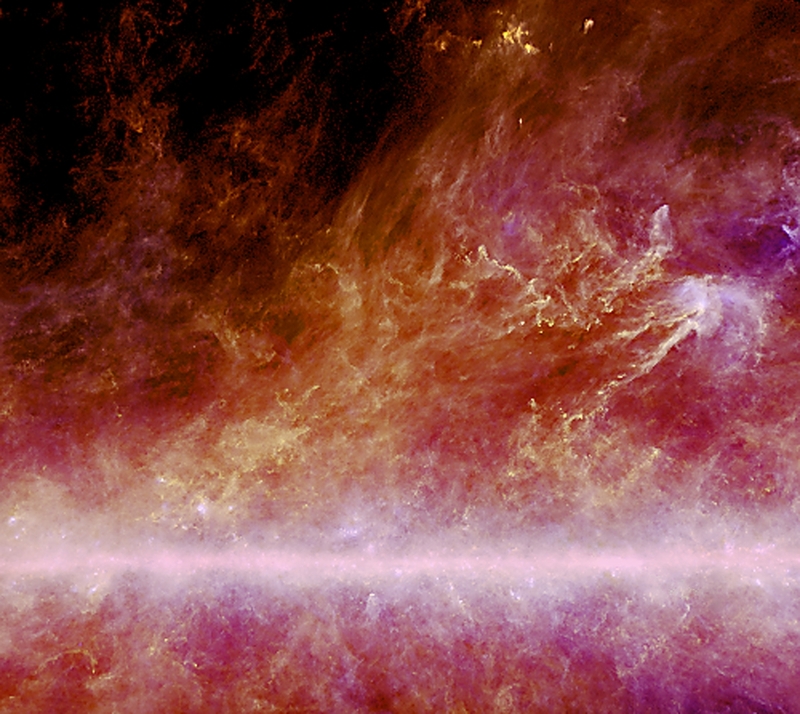 So here it is – Planck’s first view of the whole sky! The image is dominated by the dust in our own galaxy, seen in blue, but in the top left and bottom right you can see a more mottled structure which is the cosmic microwave background. The next all sky survey, currently being observed, and a lot of processing are needed to remove the foreground galactic emission and the emission of intervening galaxies and galaxy clusters before we can get a clear picture of the microwave background. That’s the point at which we will be able to see the exciting new results on cosmology that will come from Planck. There’s a lot more to come as well, as this image shows, with information on our own galaxy and others. This overlay shows some more information about what we’re seeing and highlights well known objects and parts of the sky, as well as images already released from Planck. More coverage available from ESA and the BBC. A new press release from the European Space Agency presents some of the first new science from the planck satellite. We don’t have results from the microwave background yet – we need another 6 months to complete the second all sky survey and then a lot of time for data crunching for that – but what the new results show are exquisite images of cold dust in our own galaxy in what is the largest area submm survey so far made. What can be seen here is the galactic plane itself – the line running horizontally across the image near the bottom – and the huge clouds of cool dust that rise far above the plane. Hints of these were first seen by the IRAS satellite, but the Planck observations are at much longer wavelengths and are thus able to find cooler dust and determine dust temperatures. These results also highlight the synergy between Planck, which gives us the largest scale structures in the galactic dust, Herschel, which can show us smaller scale structures (see eg. here), and ground-based telescopes such as the JCMT which can work at still higher resolutions. This is all just a taster of what Planck will produce, but there’s lots more work to be done, and observations to be made, before we get there. The Telegraph who even quote me! And I’m sure there will be more. Anybody who spots something please add to the list via a comment!